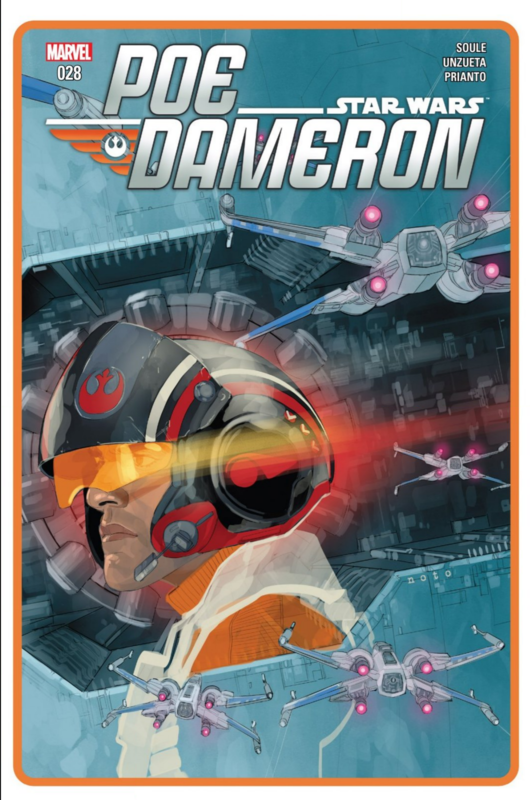 This review is for the Star Wars: Poe Dameron comic, #28, released on June 20th, 2018. There are spoilers for the comic contained below. In other words, if you don’t want to be spoiled: stop now. 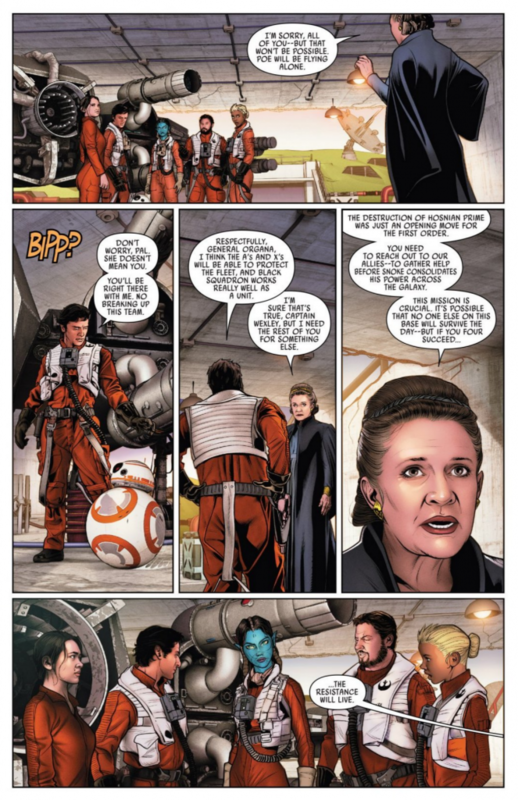 If you just want to find out what happened to Poe Dameron and company in the latest issue, then venture on! The comic opens right where the last one left off, with a retelling of the Battle of Starkiller Base. It gives us some interesting details, like how the battle only included X-Wing fighters because the bombers (that we all saw get destroyed in The Last Jedi) were off on another mission. It doesn’t say what other mission, or what could have been more important than destroying the Starkiller Base when it was set to destroy D’Qar and the Resistance in its entirety, but it does at least make some small effort to explain where the rest of the Resistance fleet was during the battle. Additionally, they also mention that Furillo and his astromech V8-R were the first to die in battle, followed by Red One. Who was Red One? They don’t know. The mission log of who passed away in the attack was lost back on D’Qar, and so it’s doubtful that they’ll ever be able to recover the names of everyone who gave their lives fighting for the Resistance. This portion of the story really stood out to me for two reasons. Considering the upcoming Star Wars: Resistance TV show, they could potentially release a mission-style book of everyone who passed on fighting for the Resistance and their stories and release it as a tie-in companion to the TV series, modelling it after Poe Dameron’s pilot log released alongside The Force Awakens. It could be interesting to hear the stories of who decided to give their lives for the Resistance, and why they did it. Did they have family that fought in the Galactic Civil War who sought to carry on their family legacy? Did they lose their planet and their home to the destruction of the First Order? While hardly a necessity to canon, it would be nice to see some of these stories enriched a bit more to help flesh out the Star Wars universe as a whole. 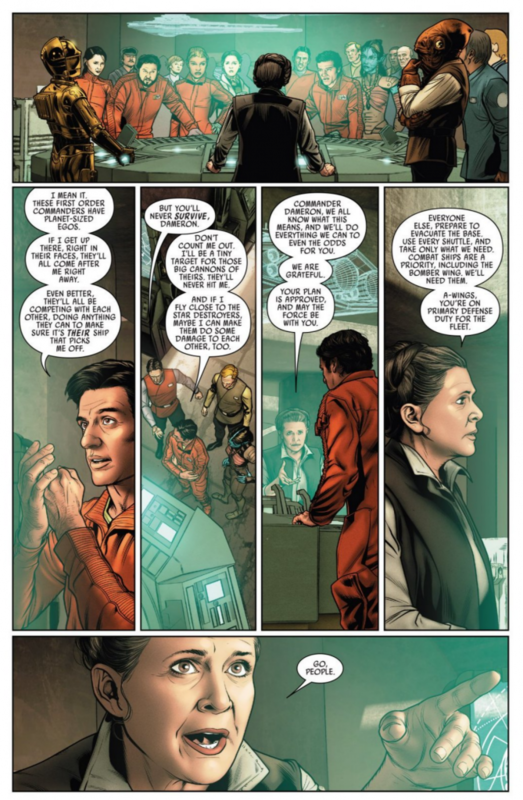 A strong theme of this comic that gives a strong nod to the still untitled Episode IX is that you always have a choice: “Despair…or hope.” More specifically, they point to General Leia Organa still leading the Resistance with the line, “As long as she’s here, there’s hope.” Considering the death of Carrie Fisher that still feels all too recent and the unknown fate of General Organa, it makes us wonder how Episode IX is going to open. Is the Resistance going to fracture without Leia there to guide it? Or will Poe or someone like Colonel Ematt be able to step up and take command of the despairing crew? This is a bit of a confusing line. What’s going to happen? What’s Rey going to do that hasn’t been done before? 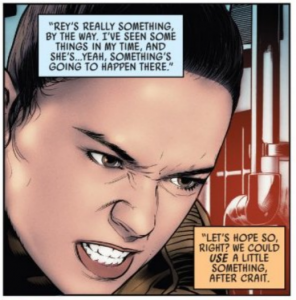 It also seems to imply that Rey is officially involved in the Resistance now, which is a bit confusing in and of itself. Rey spent the entire film trying to get back to Finn and to uncover what the Force meant to her, specifically. After Luke failed to teach her what she wanted to know, she resolved to try to bring Kylo Ren back to “Ben Solo” in order to end the war, basically to remove herself from the equation of being the Resistance’s savior. Similarly, Finn spent the film trying to keep Rey out of harm’s way, heading off to Canto Bight to try to help the Resistance so that Rey wouldn’t drop back in and end up being destroyed in the middle of a space battle. It’s hard to say whether the two are “officially” with the Resistance at this point, although it seems likely that they’ll be fighting for the Resistance in Episode IX. 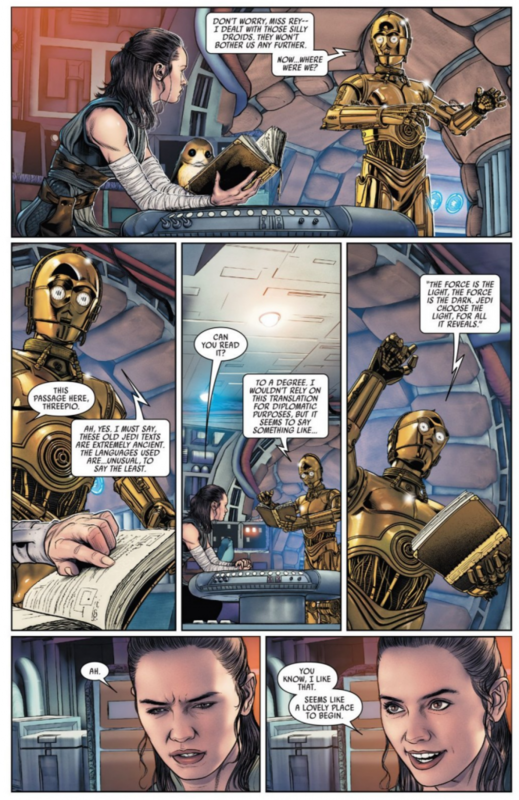 The story continues with a quick shot of Rey, working with Threepio to read the old Jedi texts. When he gets to the part about the Force being a balance between the light side and the dark, and how the Jedi chose the light, Rey agrees that it sounds like, “a lovely place to begin.” Considering how many speculated that Rey would potentially choose the dark side in The Last Jedi, it seems that this is Rey choosing the light side of the Force and taking her place as the metaphorical last Jedi that Luke warned Kylo about during their final showdown on Crait. It then skips over to Poe and Finn, who is checking on an unconscious Rose, “still sleeping.” Finn asks Poe to fill him in on what happened to the Resistance after he got knocked unconscious in his lightsaber duel with Kylo Ren, and Poe fills in the gaps that we missed between The Force Awakens and The Last Jedi. With no planetary shield around D’Qar (and let’s be real, why wouldn’t they have a planetary shield around their main base??) they decide to evacuate, and Poe volunteers to risk his life in order to try to hold them off so everyone else can evacuate, as shown in a deleted scene with Lieutenant Connix in The Last Jedi. But what’s happened to Black Squadron? They were supposed to be off recruiting allies, but they never answered the Resistance’s distress call on Crait during The Last Jedi. 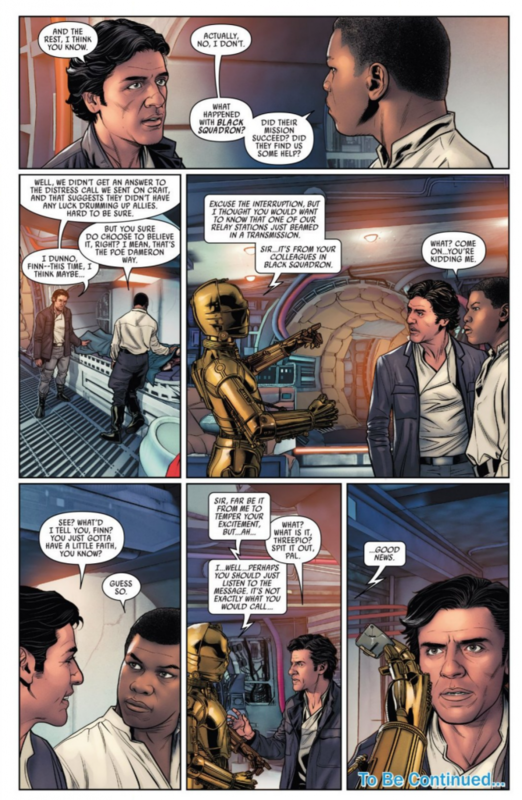 Poe is just reluctantly admitting to Finn that he fears that the worst may have happened to them when Threepio comes in with a transmission from Black Squadron…and it’s not good news. The chapter ends there, and it’s hard to say what’s going to happen next, as we’re starting to venture into uncharted territory. With Episode IX not coming out until December 2019 (or 547 days, if you want to get specific), this is the first real glimpse of our heroes and their adventures after The Last Jedi, potentially setting up for things to come in Episode IX. Overall, I think that this was a pretty good chapter of the story. Personally, I’m glad that the retelling of The Force Awakens is finished – while interesting to hear another perspective, we know what happened there, and I’m interested to see the dynamic of Rey and Finn and how they fit into the Resistance going forward. And considering that this comic series began with the stories of Poe and Black Squadron, I’m excited to get back to focusing on the adventures of Black Squadron again. Considering the important role they played in The Force Awakens, their disappearance during The Last Jedi was unsettling, and I hope they have a bigger role to play in Episode IX. An end to Black Squadron? Say it ain’t so! So what did you think of this issue? Did you like the retelling of The Force Awakens or are you more excited to see where Black Squadron’s adventures have taken them? Are you ready for this series to end, or do you think it’s gone on past its prime? Sound off below and let us know your thoughts!